The first round of voting in the Ellsworth Area Chamber of Commerce ‘Best of’ Awards competition came to a close at midnight this past Monday, January 29. Hundreds of voters helped narrow down the field to determine the three finalists in each of seven ‘Best of’ categories. It was a tight race in several categories, with very close margins among many businesses! However, the community's work is not done. There's one more round of online voting, with this round determining the final winners. The final round of voting kicked off this morning, Thursday, February 1. This final round will continue through midnight, Saturday, February 10, at which point the organization receiving the top number of votes in each category will be named the ‘Best of’ Award winners! Rally your friends and family to vote to recognize the businesses you think are serving the community best! The awards will be presented at the chamber’s Annual Dinner, which will take place at Kilkarney Hills on Monday, February 19. 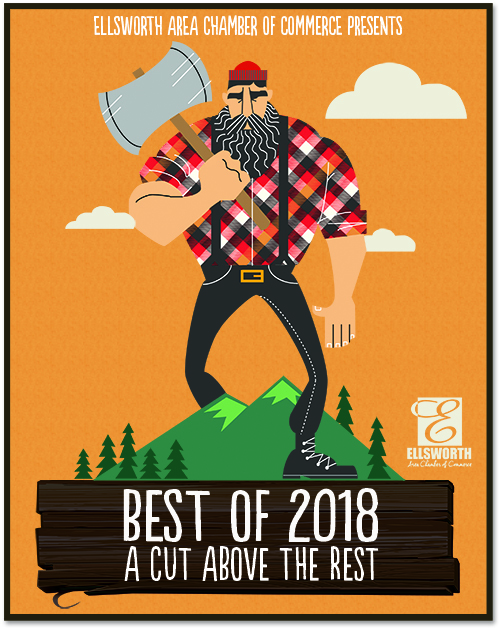 Winners will receive a commemorative poster to display at their business and have bragging rights until the 2019 ‘Best of’ voting takes place next year. You can view the official rules and cast your votes here. Additional announcements and news about the competition will be made available on our Facebook page. Your participation means a lot to our members. The fact that the community is so enthusiastic and excited to take part in this competition is appreciated... THANK YOU!